Sometimes we need an extra hand in life; but in magic we don’t ask for much just an extra thumb. Use the Magic Thumb Tip to make a handkerchief vanish. But hey don’t stop there feel free to get a little creative. Salt pepper whatever you can fit. Think big (or small it is only a thumb.) 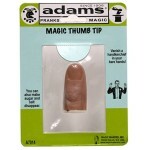 No matter what you make vanish your audience will be sure to give this illusion a “thumb’s up”.